New Verizon iPhone Model This Fall? 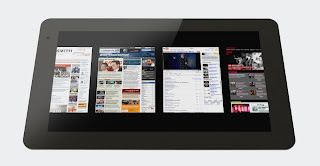 According to Engadget, the JooJoo tablet is now shipping. Customers will start receiving the 12.1 inch screen JooJoo tablet as early as March 29. Read the previous post. 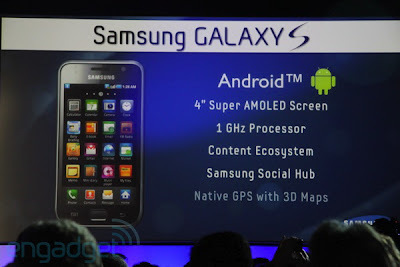 Samsung unveils its new Galaxy S. The new Samsung smartphone is based on Google's Android software. The Samsung Galaxy S would include an advanced screen technology called Super AMOLED that promises a display that is 20 percent brighter than existing phones and ideal for showing video on cellphones. 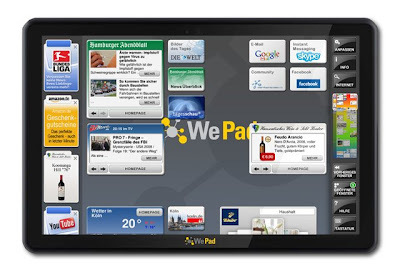 WePad is Neofonie's version of the iPad. The WePad tablet features an 11.6 inch, 1366 x 768 pixel display, a 1.66GHz Intel Atom N450 processor, GMA 3150 graphics, a 6 hour battery, Webcam, 2 USB ports, and a flash card reader. It runs Google Android. You can be a WePad tablet Facebook fan here. 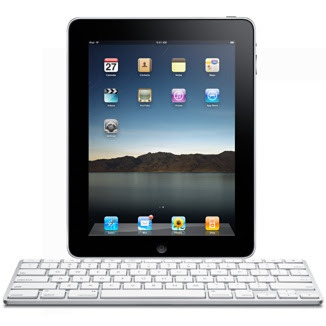 Apple will also release the iPad Keyboard Dock to attract more people to the product. Apple wants everyone to know that the iPad can also be used for heavy typing. * Connect the dock to your computer with the USB cable included with your iPad to sync iPad and charge its battery. * Connect the dock to an electrical outlet using the iPad 10W USB Power Adapter (included with your iPad) to charge the iPad battery. * Use the dock to hold your iPad at the perfect angle to compose email and notes using the keyboard or to watch your favorite videos or photo slideshows. * Connect the dock to a stereo or speakers using an AV cable or a stereo audio cable to play music from iPad. The attached keyboard features a sleek anodized aluminum enclosure with low-profile keys that provide a crisp, responsive feel and an ultracompact design that fits on even the most crowded desk. Special keys provide one-touch access to a variety of iPad features — the Home screen, Spotlight search, display brightness, picture frame mode, the onscreen keyboard, and screen lock. Buy it from the Apple store. More videos from the HP Slate. Alan Tam from Adobe Flash Product Marketing walks us through Adobe Flash and Adobe Air functionalities on HP's upcoming slate device. Apple has chosen the Oscars award 2010 to debut the first iPad commercial! The ad also officially announced the iPad release date: April 3. The soundtrack of the iPad ad is The Blue Van's 'There Goes My Love'. People are talking about the Microsoft Courier tablet after videos of it came out last year. Engadget got some hints that the Microsoft Courier may be out this year. No word of the price yet. Will it be cheaper than the iPad? I hope it is, although the Microsoft Courier seems to have so many incredible features. 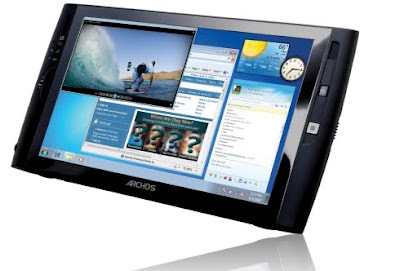 Archos 9 tablet will be faster than the current models. The new Archos 9 tablet will have a 1.2GHz processor instead of the 1.1GHz Atom Z510 CPU. More features: 1GB of RAM, a 1.8″ 60GB hard drive, 8.9 inch 1024 x 600 pixel resistive touchscreen display, and Windows 7 Starter.